There are some animated films that are destined to live over and over again through sequels, and luckily, PIXAR’s Finding Dory is one of them. After the long search for Nemo, Marlin finally finds his only son with the help of Dory, who suffers from short-memory loss. Now when the family is reunited, who will help Dory to have her own? That’s what the sequel of Finding Nemo is all about – to remember and never forget that family is the only thing worth never forgetting about. Dory now lives with Marlin and Nemo. She even helps Mr. Ray to assist with his teaching despite her memory issues. One day when in class the pupils were discussing their own family and asked about the same from Dory, this is when an idea strikes her to find her own. But how to achieve that if she remembers nothing about them? 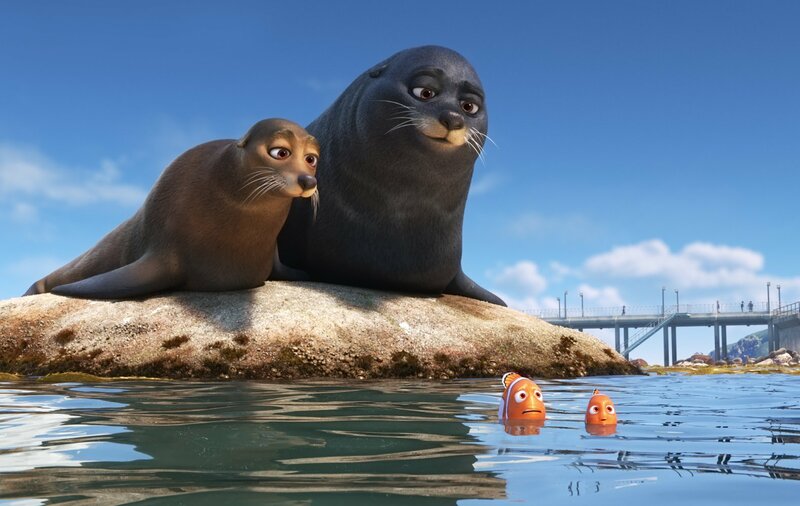 With the help of Nemo, Marlin and new friends, Dory embarks on a journey to find her parents, if they are still around…. When the film begins, we see a little adorable Dory with her parents, Charlie and Jenny who calmly and patiently teach Dory to remember things. It appears that Dory had a problem remembering things since she was a child. One day when she’s playing hide-and-seek with her parents, Dory forgets that seconds ago she was playing a game with her parents and finds herself too far away from them. Her loneliness continues for many years until she meets Marlin when he was in search of Nemo. I could have written in my review the entire plot of Finding Dory and describe new characters. However, the charm of Finding Dory is that you don’t need to know much about it, just to get your tickets, sit comfortably in a theater and wait for the journey to begin to see it yourself. It is good to have an anticipation of a surprise Finding Dory delivers – in a way that will make you feel extremely proud of living in a time when animated films are becoming more interesting, compelling and much profound than any other film you will ever see. It is amazing to see how Nemo, Marlin, Dory, Jenny, Charlie, or even Hank the octopus (voiced by Idris Elba) are so alive that you won’t notice that all the characters you are in love with are just animated. You see them as real and as part of your family you wish to never let go. In the end, Finding Dory is amazingly entertaining, amusing and absolutely fun to see. A feeling of excitement or the journey it delivers over water is something hard to forget, or, should I say it, absolutely unforgettable?